A simple way to add storage where you need it, Linen Shelf Kits feature a ventilated design to promote air circulation keeping items fresh. This design makes this kit perfect for laundry rooms, linen closets or basements. Rubbermaid warrants to the original owner that this product is free from defects in material and workmanship for a period of one year from the date of the original purchase. In Canada, contact 866-595-0525, Monday - Friday, 8:30 am - 4:30 pm. The 16-inch x 23-inch Closet Culture Wire Shelf allows for folded clothes to stay fresh as the ventilated design facilitates air circulation. 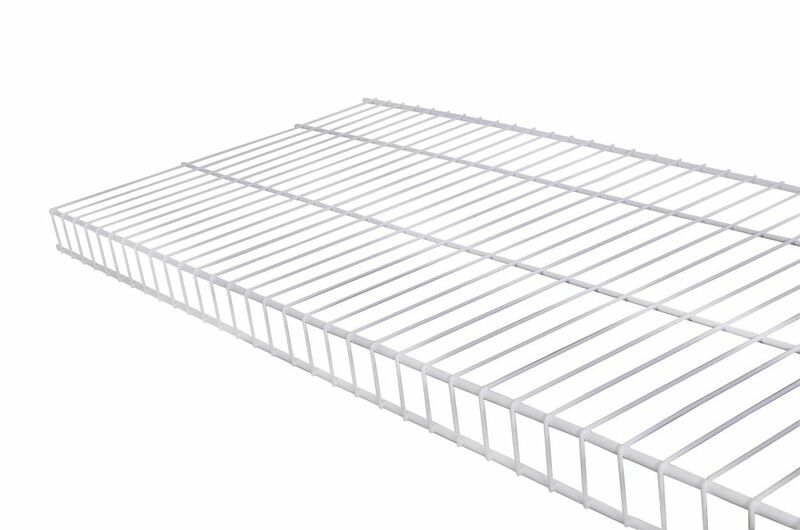 The shelf is made from sturdy tight mesh steel wire construction. The attached installation clips allow the shelf to easily snap into the Closet Culture Shelf Bracket. Once installed, the shelves sit flush with the other Closet Culture accessories providing clean lines and an upscale look to the closet. FastTrack<sup></sup> is an adjustable, easy to install shelving system with superior strength. The all steel rail and upright system is completely adjustable to help you build a durable solution to match your specific storage needs. Various shelving depths are available from 12-20 deep to help you maximize your storage space. FastTrack is ideal for pantries, laundry rooms, linen closets and utility rooms and gives you the safe, sturdy storage space you need to organize things like heavy food items, totes, laundry soap and more. FastTrack<sup></sup> Rails are the key to an easy to install system. Install the rails, then hang uprights, add brackets and shelves to complete your closet shelving system. Rubbermaid Wood Shelves are perfect for organizing cluttered areas in your home and adding a decorative touch. The surface resists scratches, stains and warping. The shelves come ready to install and are professionally finished. 16 Inch x 8 Feet White Linen Wire Shelf A simple way to add storage where you need it, Linen Shelf Kits feature a ventilated design to promote air circulation keeping items fresh. This design makes this kit perfect for laundry rooms, linen closets or basements.